Secret Wars was a 12 part series from Marvel Comics that introduced the character of The Beyonder to the Marvel Universe. The Beyonder, assembles a planet from chunks of other planets and dubs it "Battleworld". He then kidnaps several heroes and villains from Earth, and transplants them on Battleworld to fight for The Beyonder's amusement. During this storyline, Spiderman discovers his black suit within alien technology that he finds on Battleworld. This suit would go on to not only redefine Spiderman, but become one of his worst enemies as the villain Venom! 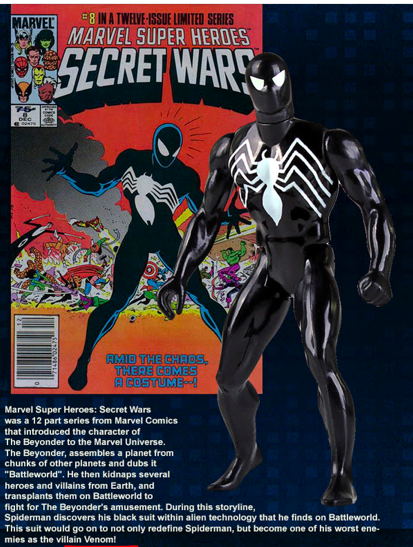 The Gentle Giant Marvel Secret Wars Black Costume Spider-Man Jumbo Vintage figure is now available for pre-order.